Say what you will about Dylan's live shows during the 70s: they were unique and never repetitive. Before the Flood went for straight rock and roll and The Rolling Thunder Revue grasped to recapture the magic and possibilities of rock and roll. 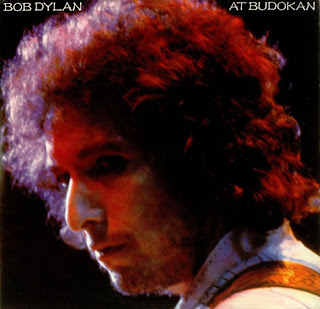 Live at Budokan is a collection of songs Dylan played on his tour of Japan in February and March 1978. These concerts were famously known as Dylan's "lounge act" phase. Donning white jumpsuits and eye liner, it seemed his road show took inspiration from Neil Diamond and Dylan's recently departed hero, Elvis. Bill Murray could've been the opening act! Dylan spent a good portion of 1978 touring, on what many cynically dubbed the "alimony tour." The grueling schedule took its toll on Dylan's voice and the shows varied in quality. With a full band and backup singers, the Dylan of 1978 favored grandiosity over spontaneity. Budokan is strictly for Dylan completists. Once the novelty wears off these songs leave little impression. "Maggie's Farm" seems static and harmless. "All I Really Want to Do" sounds like a late 70s sitcom theme. "Oh Sister" is ersatz reggae. In fact most of the album are ersatz versions of Dylan's own songs. Maybe I am missing the point and there is a brilliance I'm missing. Maybe. Rock critic Robert Christgau pointed that beneath all the schmaltz and convoluted arrangements on the Budokan LP - the songs are still powerful. That is true. But there are nice moments: "Forever Young" and "It's All Right Ma (I'm Only Bleeding)". The latter song sounds like a megachurch hymn (I doubt megachurches would ever play that one though). Thanks for sharing your story! It must have been exciting to see Dylan during that period in his career. I know there were ups and downs for that '78 tour. There are some amazing clips on youtube illustrating how exciting those performances could get. It's a shame, because the shows that were later in the tour were a lot less stilted and a lot more bluesy and freer.